The hallway in a period house usually has existing, beautiful architectural detailing, such as original floor tiles, attractive mouldings and impressive proportions. 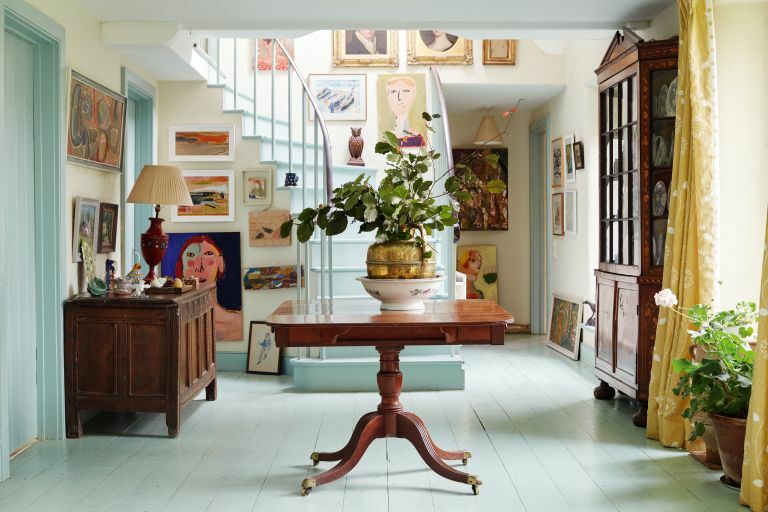 So, going to town with beautiful furniture, restoring stained glass and finding pretty accessories – you can even transform your hallway with an elegant gallery wall – can only enhance it. Here, we guide you through all the options for traditional hallway design ideas, and then some. And, if you need more general tips and ideas, find out how to design a hallway in our comprehensive guide. A bright and airy take on traditional design, an all-white hallway is the simplest way to make a design statement. Not to mention the light-reflecting properties of white paint, so important in this often dark part of the home. Accent with contrasting light fixtures, and you've got an elegant design scheme that is refreshing at the same time. This traditional hallway looks bright and chic, thanks to the white paint applied all over, even to the floorboards. Want more light-maximising tips? Find out how to lighten a dark hallway. Use our guide to find inspiration and advice for painting floorboards, too. Picking a wallpaper with an intricate design will create added interest in a hallway, but choosing one with a reflective finish is a great way to make the space feel brighter and larger. Metallics are ideal, but bear in mind that darker metallics, like copper or bronze will make the hallway feel more sombre – although warmer – and lighter metallics, such as silver or gold will maximise light. Putting a carpet just inside the front door in a period home is a missed opportunity – traditional homes would originally have had tiled or wooden flooring and it's a good idea to restore these. But if you want comfort underfoot, and added texture and interest, a carpet runner is a smart option. Choose a striped design like this and you'll create a visual trick: making the hallway look longer. Match it to paintwork for a cohesive scheme. Find out more about choosing a carpet in our guide. If you live in a house with a long, narrow hallway, it could be the perfect place for housing your library. The rows of books will add texture and interest; and to create a cohesive look, we advise painting your book storage the same colour as the walls/doors. This hallway library has been painted in Farrow & Ball's Railings. Find the best paint for your hallway in our buyer's guide. Avoid overly cool or dark colour schemes in north- or east-facing hallway, as the space may end up looking unwelcoming and dingy. Instead, opt for creamy shades, and pick a subtle pattern if there's little original architectural detailing. Find more hallway colour scheme ideas in our design gallery. Nothing quite has the ability to instantly personalise any room in the house as a gallery wall. The rules are that there are no rules, only your own preference matters. Whether it's a trendy botanical-themed collection of prints, or your children's drawings mixed with family portraits, the choice is yours. And while a very eclectic gallery wall might overwhelm a living room, we say that in the hallway more is always more. This traditional hallway instantly gives the impression of a busy family household with its pleasantly dense decorating scheme. If you do think you need a bit of guidance, find out how to hang a gallery wall in our guide. A small hallway in a cottage can really benefit from an opulent and colourful decorating scheme. Think a gorgeous ornate runner and a tasselled curtain. The soft fabrics and dense prints will prevent the hallway from looking too plain, as well as distracting from its smaller size. Find more inspiring ideas for using curtains at windows and doors in our design gallery. Like a bit of ornament, but not too much? A large hanging print is a great option for a hallway. The high-quality Kyoto Linen Wall Hanging is from Abode Living. Its faded, vintage look will fit right into a traditional hallway design scheme. Find more boho-inspired room schemes in our design gallery. Want something a bit different in your hallway that won't detract from its traditional style? Metro tiles work with most traditional schemes, but will also add interest and a formal quality we love. The Ledbury Marina Blue Pattern Tiles are from Walls & Floors. For more metro tile ideas, check out these beautiful ways to use metro tiles. A traditional style doesn't always have to mean complete faithfulness to a particular period. It can be quite fun to juxtapose different eras in the same room. There is a way to overdo it, of course, and we advise sticking to no more than two or three different styles. Here, traditional style wall panelling contrasts with more contemporary furniture. This traditional 19 century hallway has been given a Jazz Age twist with the Gatsby Marble Top Console from Atkin and Thyme. Find more design advice for using wall panelling in your home. Most hallways are relatively small, so every piece of furniture counts towards the overall look of the room. So, choose storage furniture that's both functional and attractive. As a general rule, the primary function of your hallway should determine the style: if you live in the country and love a welly walk, it's best to choose sturdy, rustic pieces that will cope with wet and mud. This lovely rustic hallway ensemble is from Garden Trading. Find more hallway storage in our design gallery. On the other hand, if the primary function of your hallway is to make a great impression, invest in a beautifully crafted antique console table, sideboard or dresser. It is always best to choose your antique pieces in person, but to get an idea of what you could get, check out Selling Antiques. Don't neglect hallway flooring. We advise giving any original flooring the love it deserves and not replacing it. Encaustic floor tiles in particular are worth repairing rather than replacing. Patterned tile works really well with traditional design schemes – and, in combination with stained glass, will provide enough colour and texture to keep the rest of the design neutral and low-maintenance. Find out how to restore and clean encaustic floor tiles. If you are renovating and will have to replace the flooring, find out how to choose the best hallway flooring. Stained glass is a feature, in particular of Victorian and Edwardian homes. If the stained glass in your front door has, at some point, been removed or damaged, it is worth replacing it with an authentic design. The best way to find something that fits is to take other stained glass in your local area as a cue. Then, find a good local specialist glazier who can make panels to fit. In a period home, it's inevitable that an original door will allow draughts into the home. As well as insulating around the door, hanging a curtain will keep your home warm in winter – and add a pretty detail the rest of the year round. Think through the fixing of your curtain carefully. This one is fixed to a hinged pole on the back of the door; if you have wall space either side of the door, it will be better to hang a pole above the door and pull the curtain right back each morning. This is also a better option if your front door has glazing within it to brighten the hallway. Check these ways to make your period home more energy efficient. In a cottage in particular, using an item that might have been originally intended for another purpose, is an easy way to add extra character. In this hallway, a large chest makes for a useful shoe storage container, keeping the hallway clutter-free. If you've stripped back the stairs and flooring in your hallway, giving the stairs and more interesting treatment than a plain coat of satin finish will add bags of character. Find inspiration for and advice about painting stairs in our design guide. Larger or wider hallways needn't be just about coming in and out of the house – giving them a purpose, such as an area to deal with correspondence, will make your hallway feel less utilitarian and more like another living space. Picking a narrow console table and a small chair and dressing the table with pretty accessories will create a big impact but take up a small footprint. A large mirror is a must-have in a dark or narrow hallway for making it feel bigger and brighter. Pick a frame that flatters the proportions of your hallway – a large or tall one will fit well in a hallway with a high ceiling; a deep, ornate frame will sit well in a wide hallway; slimmer, less obtrusive frames, painted to match the wall behind, will make a small or narrow hallway feel as large as possible. Painting woodwork in a dark colour will give a period home instant drama. And you needn't worry about the dark woodwork making the hallway feel unwelcoming – simply hang wallpaper in a warm shade and pick out a runner to match. Wallpaper and paints by Little Greene.